Angus is a local farmer who is dedicated to organically raising and feeding his cattle. They graze freely, feeding only on natural substances. To increase growth rates in his cattle and remain competitive, Angus uses an innovative technique called ‘mob grazing’. In short, mob grazing refers to the farming method whereby cattle are kept in small, temporary camps. These camps are easily set up in prime grazing areas. The key lies in the size (and the cows’ greediness): the grazing space is limited enough to encourage the cows to compete against each other to eat more grass. So, the cows end up eating more and growing faster. 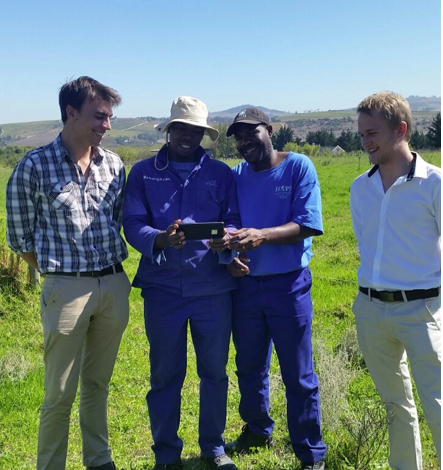 Here at Polymorph, our team has been developing an application called MobGrazer to assist Angus and other farmers just like him. Our application tracks where the grazing camps are built, and stores information such as grass quality and average cow weight. This information can then be used by the farmer to make more informed decisions.This provides knowledge such as where the cattle are or why they don’t gain weight and what the optimum duration of each camp should be. We handed over the beta of MobGrazer to our client, Angus, for testing. After a quick tutorial on how to use the application, he and his workers were able to use it effectively – with great results.